The Casa Grande trail system has grown up since I started riding there in 2007. It’s been a few years since I explored the new trails, but I really like the Ridge trail cut a bit higher on the mountain than the original trails. 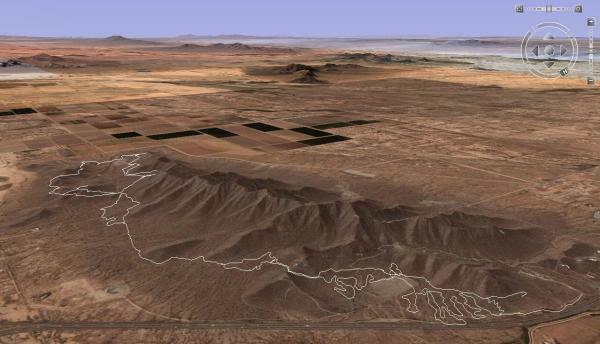 Read up on the trails at the Casa Grande Mountain Park page, and view a printable Map too. Download a PDF of the Casa Grande Mountain Trails Map. Casa Grande Mountain from MTBikeAZ on Vimeo. Fun section of CGM. One of about 12 clips from the mountain. Raw footage only. Vholdr mounted to bottom tube of frame. Watch as I dodge cholla cactus. UPDATE: Casa Grande Mountain is getting a facelift…Expert trail builder Mark Flint has been hired by the city to design new trails on the mountain. Flagging started in 2009 and trail building began early in 2010. Read John’s great ride-up of his exploration of the trails. First thoughts are that this trail rocks. Pristine singletrack no more than 24 inches wide in most places. This morning I had first tracks over some freshly raked trail. It’s the groomed corduroy of the desert. There are two distinct sections of trail. The north side loops are about 5 miles total. If you ride over the saddle from the north side you enter Phil’s Wild Ride. It’s not really called Phil’s wild ride but it should be. Phil, a Casa Grande local, has built most of the trails over that first saddle that lead to the south side of the mountain. There are a few different ways to ride the north side loops. A couple of connector trails let you mix-n-match till you find what you like. The trails here are not too technical as they twist and turn up and down the mountain. There are even a couple of nice jumps and two wash bridges to cross. The south side trails run from the saddle clear down to the south point of the mountain in a Desert Classic-like fashion. They have the look and feel of Wild Horse out in near Hawes with a little bit of Twisted Sister action and a smattering of Pass Mountain. The further south you go the more technical it gets. There are quite a few trails to choose from to get the south point. The East and West Legs are the most technical with Bootleg-esque exposure, steeper climbing and more technical descents. The locals have built an awesome system in Casa Grande. It’s such a new system that the singletrack is still SINGLEtrack. I feel some serious respect for the trails, knowing that it local sweat maintaining the mountain. My thanks goes out to everyone who have built and maintain these trails. I’ll have to do my part and give back to the mountain. Last Saturday I met CGCharlie, his wife Doris, and friend Clarence out on the trail. Charlie has built most of the north side trails and continues to clean and cut new ones. Today I met Robert, a local who helps maintain the trails by raking and riding frequently. Casa Grande Mountain is the best kept secret outside of Phoenix. It doesn’t have to be that way. Spread the word. Exit 200 Sunland Gin Rd. from Phoenix/Chandler go right, from Tucson go left. First right is Arica rd. it will be after the truck stop. Follow Arica rd. and when you reach the unpaved area you will see signs posted. Rode this trail a couple times over the holidays. Primarly the Ridge Line Trail with a loop around the South End mountians (black marked trails). I stayed away from the blues and greens on the valley floor. Nothing here is too technical and none of the climbs are in anyway steep but you will work up a sweat and your legs will feel the climbs after your done. Nice easy going grades and well done. You won’t spin your rear tire here. It’s a very nice/fun ride and worth the 1/2hr drive from the SE valley. My only complaint is its only 5miles out so if you want to do anything close to a 20miler, you will have to mix and match and re-ride sections. The most challenging segment would be the extreme south tip of Ridgeline, northbound to the highpoint/saddle. Been there a couple times, its got some pretty sweet downhill sections its not just climbing and short descent . I lived in Casa Grande around 2005-2006 would ride from down town C.G. to trail on a single speed had a blast on the Mt. Locales here doing great job on new trails.Way to go. Mike I believe you will enjoy the new trail! Hiked some of the new trails and all I can say is “Yawn”!!!! Just a small note on the shooting. We have been working with the city very closely on the trails project and two things come up on a regular basis; Shooters and Fencing. First off there is no fencing even close to the trail (existing or new) that is on city property. If you are in an area where you find fencing blocking your path, you are in the wrong area of the mountain. There are currently two places to park where you can have unrestricted access to the existing trail system, including the newer sections from recent build events. The first, and most popular, is at the North end of the mountain at the end of Peart road. This is on private property that is not patrolled or maintained by the city but I have never had a problem parking there. The second is at the end of Arica Road as described above. This is on City property and will more than likely be the location of the first official trailhead and parking area to be built by the city. If parked in either of those areas, you should have access to the single track trails that CG Mountain is known for. The dirt roads and double track atv trails are not part of the existing or future trail system. There are currently no restrictions to using them but you will encounter barbed wire fences along those routes as the city and private property owners work to define what is legal and sanctioned trail. There were signs posted stating that it was illegal to shoot and that the area was closed to ATV’s and motorcycles. The signs continue to be vandalized and removed. It has been a point of GREAT frustration for the local land manager Rod Wood. In conjunction with signage the CG Police have committed resources to the enforcement and patrolling of CG Mountain Park. The shooting has been reduced but it will take time before it stops all together. I guess the point is that the city is trying to improve the area. There are many factors that come into play here. Having a unique perspective gives me some insight into the issue that many of you may not be aware of. We hope everyone that visits will continue to enjoy a trail system we work hard to build and maintain. Remember that most of the existing trails were build by cyclists and is currently maintained, predominantly, by cyclists. Road Casa Grande trail today top to bottom. It is nice to see progress being made on the new trail system. It looks like it will be higher up on the mountain and looks like it will flow rather nicely. Spotted some shooters on the south side, at least they weren’t shooting towards me on the trail. I saw the new barb wired fence it was still up but someone had twisted it together to go under it on foot. It would be nice to get some signage placed by the trail designating no shooting and that a trail exists. If this is something that could be donated to the city it is something I would be interested in. It was also nice to see others using the trail, only second time in two years. The CG Mountain trail system is getting better and better. New trails are being built and older trails are being kept up and worn in. I see more and more users all the time. With that being said there is still significant concerns with the overall safety of the Southern area. Shooters are ever present and now a new danger; BARBED WIRE fencing across traveled roads. The fence that has been erected has NOT changed the shooting in the least bit!!!! The fence was cut within a week of it’s erection and repaired and cut again immediately. The fence was put up in June and NO signage was posted except on Mountain View Ln, this portion of the fence is still intact but a mile north of the main shooting areas. The fence erected on the Southern part, along where Shedd Rd would align, has no signage at all. The other day someone had set up a shooting target on the fence making the entire mid-southern trail area their backdrop. The fence they erected is barbed wire and it crosses three well traveled roads without any warning that the fence is there. Sometimes I hike in this area in the late evenings or even at night, also many bikers do the same, and I have had close calls with the fence myself. In my opinion the area is less safe than before!!! I agree with talking with people shooting in this area. I have politely talked with several shooters and they all were just un-aware of the trail system. None of the people I have spoken with have I seen shooting in the area again. The truth be known, they actually were here first. This area has a very long history of being a shooting grounds. With the progress of the trail system, wrapping around all the mountains in the area, there are no longer any safe areas to shoot (except for the shooting ranges of course!). The trail system has pushed them out, but since there is no signage to this effect, we’ll all be very old by the time we talk to everyone. The fence is a necessary part of making this area safer for everyone. But without signage, education and enforcement, it is a very weak approach by itself. Also, does it really need to be barbed wire? There are other viable options. Barbed wire fencing is designed to control free range livestock, not people! I have seen what barbed wire can do to a person, it is not pretty. So now: Beware of shooters, and of unmarked barbed wire crossing roads!!!!!! If interested in volunteering for anything, there is a section where you can sign up for an upcoming work event. The events are pretty low key and everyone seems to have a great time. Please take a moment to see if there is a date you could come out and help give back to the trails that we all use and enjoy. Just to update anyone interested. The shooting has been curbed quite a bit. The city has put up fencing and signage letting folks know that shooting there is illegal and poses a safety issue. This has cut back on the shooting quite a bit. Occasionally you will see someone but we have been addressing them directly and educating them on the use of the range rather than the wilderness. What a great trail!! I rode the entire thing this morning starting at the big cactus and just kept taking the trails to the right the entire time. Just cruised it finishing in 1:43 with an average speed of 7.7, around 13.5 miles worth of stuff. Definitely fun and challenging on the south end but nothing too tricky. No mandatory hike-a-bike anyplace. I did put a foot down about a half dozen times but that was just because I didn’t know the trail. There must have been a mile to a mile and a half of freshly raked trail on the black trail system that I was the first over. I am not sure who maintains this trail system but they are doing one heck of a job!! I was the only one out there for a Sunday morning so people are missing out. I live in south Chandler and it only took me about 45-50 minutes from driveway to trailhead. This is closer than Estrella for me and maybe even McDowell. Guess where I am going more often! Although Casa Grande mountain has a beautiful shooting range on the northwest side of the mountain people shoot on the south and east side recklessly. Yes, I second the safety precaution on the southern end. I won’t even go there if I even hear shots from the distance. I had one close call a while back where bullets were a blazing and all I could do is backtrack to cover. I am sure this will be addressed at some point in the future. I’ll bring it up with Round Trip Bikes and see what they know about it. Wonderful trails and nice scenery sums up this area. There are many miles to Bike or Hike, and very nice trails too. Spring is upon us and the desert really comes alive during this time, and this is a nice way to check it out up close. I hike this area several times a week and I really love it. I can easily take a 10 mile hike without backtracking too much. The future plans look great too, it looks to almost double the trails. You do need to look out for people shooting accross the trails, particularly on the Southern end (I like this portin the best). There are no signs designating this as a trail park and there are constantly people shooting randomly and VERY OFTEN accross the trails or the trails are in their line of fire. You WILL want to bring a safty whistle to make them aware of your presence and that you wish to hike/bike through. Most will allow you to pass after they see you. I would hope that someone is going to address this serious safety issue soon. Just be very careful on the Southern end!!! This trail is a blast. Narrow rocky single track, some challenging sections through rock washes. I live in Queen Creek and work nearby in Eloy. I snuck out of work early to get a ride in. I didn’t complete the trail as I was running out of daylight, but plan on making it back at least once a week. Hats off to those who built the trail. Very cool! Hey BarqsMan or Shawn – did either of you calcualate the total distance of the blue and black trails…doing a loop from the trailheard off Peart? Very fun trail if you get on the right section! Do yourself a favor and click the “topo” map at the top of this page. Ride the blue and black trails and STAY AWAY FROM THE GREEEN-unless you enjoy bad books and boring movies. I thought I was going to slit my wrists! I just took the wrong turn starting off. This would actually be a great trail to take my kids on and I plan on going back with them. It should give them some fun/challenging stuff to ride. Follow the directions from Peart Rd. to the trail head. Start the ride at the “lone cactus”. About 100+ yards the trail forks – go right and climb the switch backs (left goes to the kids area). You’ll dead end into another trail – go left. This trail is a lot of fun and challenging. It will take you out over the saddle into some great views. Make sure you do the black loop shown on the topo, and then you head back, making it a lollipop ride. I want to do it again! I rode this trail yesterday (8/30/08). I’m in Maricopa and started from the north end. I missed the trailhead by the cactus, so ended up following the jeep trail until I decided to head toward the mountain and intersected the singletrack. It is good….once familiar I will speed it up a bit, but be careful the first time……. I got there from Peart. Parked at the end of the paved road……lot’s of broken glass. It was a couple of days after a storm and I only saw 3 or 4 tracks. This trail would really develop with a little more traffic. I’m 30 min. from it or South Mountain. The Casa Grande trail had nobody on it when I went, but the trail is well formed. P.S. I did come across one rattler. The trailhead is a bit tricky to find. Follow Peart to the end just past the hard right turn. Right before the pavement ends, hang a left off the side of the road onto a “hard to see” jeep road. Follow the jeep road about a quarter mile staying right when it forks. There is a lone cactus with no arms that marks the trailhead. See the photo above. Good luck. After riding the trail. Let me know what you think. Where is the access to the trail head? I looked for it today is it off the end of Peart?